I am really pleased to see you on my blog. My name is Irina Tereznikova (city Togliatty, Samara region, Russia). By the way, I live in Russian industrial city with Italian name (called in honor of Italian communist Palmiro Togliatty). I am a food blogger. Started feeling passionate about cooking a bit spontaneously. In the recent past, I was the owner of a small company retail and wholesales selling car accessories and car sound (car alarm, car speakers, amplifiers and so on). After closing down my company and my retail shop, I have started been having a lot of free time, which I began devoting to learning English and cooking. That’s why I am blogging on 2 languages (on purpose to have some practice and draw attention to Russian cuisine). Later, after buying a country house, I developed a passion for garden and cultivation of various vegetables too. The stimulus to start cooking was a negative moment — worsening quality of food in our grocery shops and supermarkets, especially a low quality level of ingredients. On this blog I am trying to explore different cuisines from different countries. Travelling have inspired me to cook various dishes at home adapted to our meals traditions. I’m sharing the recipes and my cooking experiences with you. On the other hand, I have decided to blog in English just adapted old-fashioned Russian recipes and some ones from former Soviet Union republics cuisines. The name of this blog was made up at once. 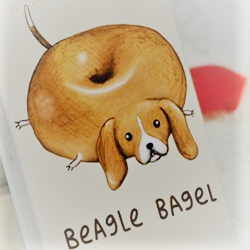 Bagel is close to old- traditional Russian fast food Bublik (Бублик) and Beagle (Бигль) is the breed of my lovely dog Sherry. I am really hoping you will be able to discover for yourself some useful and interesting information, facts, recepies and started be inspired to make your own delicious dishes. Also to join the foodie community around the world!